We know that sickness comes in different patterns for each child. For example, your two year old may only get sick once a year, while your three year old may get sick a couple times each month. Both children ride in the same cars, play and sleep under the same roof, and more than likely attend the same daycare or school. 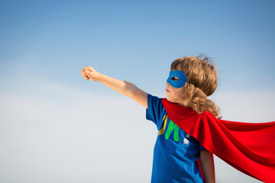 We can help your child feel like a super hero! The answer is their immune system. The immune system effectively fights disease, bacteria, viruses, fungi and parasites when it is functioning at a hundred percent. The key to making sure your child’s immune system is strong is to have their spine evaluated by a chiropractor. Your child’s brain and nervous system are responsible for all healing. All nerves that supply vital organs and healing processes run through the bones in the spine. Picture a garden hose in your mind. Can you see the water gush out when it’s turned on? Now, imagine applying pressure, or a kink, to the hose. You can see that the water flow is diminished. The same analogy is true for your spine. Even the smallest “kink” can lead to irritation of the nervous system, altering the ability of the nerves to supply the body with vital communication for function and healing. This inhibits your child’s ability to ward off disease and lengthens recovery time. Chiropractic adjustments for children are safe and effective. In fact, it is the most non-invasive check-up your family will experience. It is common for parents, who are brand new to chiropractic, to feel skeptical. We get it. What many parents have found is that when they stick to the recommendations, their child’s health improves. Read their stories here and contact us if you have any questions.